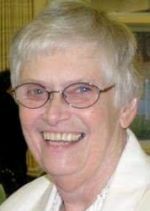 Dominican Sister of Peace Sister Carolyn Krebs, former president and member of the Leadership Team of the Dominican Sisters of St. Catherine de’Ricci (Elkins Park), died peacefully Jan. 18 in Bethlehem, Pa. Sister Carolyn worked in the retreat ministry at Elkins Park, and at the time of her death she was actively involved in parish ministry at St. Isidore Parish in Quakertown. The funeral Mass and burial will be held at a later date. R.I.P. I REMEMBER HER AS SISTER ALEANRIA, O.P.